Who says grand fireworks are just for New Year celebrations? 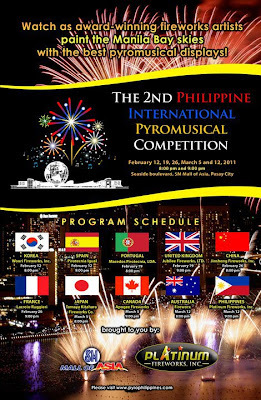 Well, I think it is, somehow, because it’s the time of the year again where we witness these glowing sticks brighten up the sky of Manila Bay and enjoy the amazing show of Philippine International Pyromusical Competition! Now, on it’s second year, SM Mall of Asia with cooperation with Platinum Fireworks, Inc. bring a spectacular and better fireworks display that will make your jaw drop to amazement. Last year’s show is still fresh in my mind, and now that having a VIP ticket to see this exciting and colourful show…. I mean, WOW!!! And last Saturday, February 19, the second Saturday of this competition, I got to witness the neck-to-neck battle royale of Portugal and the defending champion, United Kingdom. Portugal gave out a hair-raising show from start to finish. The use of romantic rock songs gave a real drama to the show that was applauded a lot of times. Here are some of the pictures I took during Portugal’s show. Take a deep breathe because here are some of the pictures I took during the show. I also have a clip of the “Fireworks by Katy Perry” part. Hail the Queen! One totally awesome show! Colors, sound, synchronization – FABULOUS! Now, I can’t wait to see the next show! China and France next Saturday! Congrats to Portugal and United Kingdom for this awesome show! Thank you and congratulations too to SM Mall of Asia for this breathtaking show!